The University of Florida and University of Central Florida club tennis teams continued their 2012 rivalry when the UF "A" team defeated the UCF "A" team by a super tiebreak 26-25 (7-4) in the final of the FGCU Dirty Bird Classic, held Jan. 28 on the campus of Florida Gulf Coast University in Ft. Myers, Fla. In the consolation bracket the Florida State University "A" team defeated the UF "D" team 25-15. "The tournament went well, especially with only have 10 courts and time restrictions," said FGCU Tennis Club President Melissa Engel. "Many other club presidents on Sunday relieved my stress by saying how well it went! Everyone seemed to love it! And I was very proud of our 'A' team making to the semis." Other participating schools were the University of Miami, Florida Gulf Coast University and the University of South Florida. 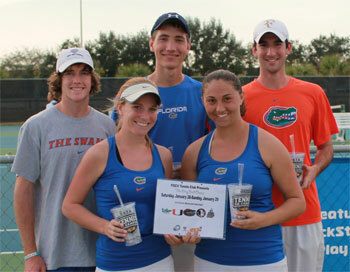 FGCU was the recipient of the 2011 USTA Florida Tennis on Campus Tennis Club of the Year. The USTA's Tennis On Campus program is designed to provide college students with opportunities for team camaraderie, social networking, and rivaled competition through tennis without the rigors of a varsity program. Perfect for athletes who have chosen not to make the jump from high school to college varsity, Tennis On Campus offers co-ed team-based play, regional and national championship competition, and helps students maintain active and healthy lifestyles through their college years. Currently, the program is offered on over 500 college campuses and services over 30,000 students. The USTA National Campus Championship is the pinnacle of the Tennis On Campus program. Hosted in partnership by the USTA, National Intramural-Recreational Sports Association (NIRSA), World TeamTennis (WTT), and Intercollegiate Tennis Association (ITA), this venue features 64 college and university co-ed teams competing for bragging rights and the illustrious title of National Champion. Club Tennis Teams can qualify for a bid to the USTA National Campus Championship through participation in their USTA Campus Championship-Section Event or by applying for an at-large/first-come, first serve bid. For more information on USTA Florida Tennis on Campus go to http://www.florida.usta.com/College-Tennis-Pages/23473_Tennis_on_Campus/. The United States swept Belarus 5-0 in the Fed Cup by BNP Paribas World Group II First Round of play on Feb. 4-5, 2012, on indoor hard court at the DCU Center in Worcester, Mass. After leading 2-0 on Day One, Serena Williams opened play and clinched the tie with a 5-7, 6-1, 6-1, win over Anastasiya Yakimova. The opening set was the first set Serena Williams has lost in Fed Cup competition. Yakimova was substituted for world No. 1 Victoria Azarenka, who did not play both Saturday and Sunday due to a lower back injury. Williams struggled with her consistency, at one point smashing a racquet in frustration. "I've demolished some racquets. Yeah, that was nothing," Williams said. "That just goes to show you how frustrated I was out there today. I haven't done that in a match in a very long time." In the dead rubber singles match, American teenager Christina McHale won her second Fed Cup singles match of the weekend by defeating Darya Kustova 6-0, 6-1, in just 53 minutes. In doubles, Venus Williams and Liezel Huber defeated Yakimova and Kustova 6-1, 6-2. This was Venus Williams' first match since the 2011 US Open. Since the Fed Cup home-away format was instituted in 1995, the U.S. is now 18-3 when playing at home. The team holds an overall 141-32 Fed Cup record. The U.S. advances to the World Group Playoff, held April 21-22. The World Group Playoff includes the four teams that lost in the World Group First Round (Spain, Belgium, Ukraine, and Germany) and the four teams that won in the World Group II First Round this past weekend (United States, Japan, Slovak Republic, and Australia). The top four teams in the updated Fed Cup rankings will be seeded and will be drawn against the four remaining teams on Feb. 14. The winners of the World Group Playoffs will advance to the World Group next year and contend for the 2013 Fed Cup title.